BLI (Buyers Laboratory Inc), the world’s leading independent evaluator of document imaging devices and solutions, has seen it fit to bestow upon Samsung a most prestigious honour. They’ve been given the ‘2016 Monochrome Printer / Multifunctional Printer (MFP) Line of the Year’ Award for their outstanding monochrome printers and MFP (multi-Function Printer) series. BLI’s Line of the Year Awards honor the manufacturers whose product line is determined to be the best overall. They have several categories with entrants being put through the ringer via in a series of cumulative two-month laboratory evaluation. BLI’s highly experienced staff of technicians and analysts then choose the winner for each category after subjecting scores of devices from every major OEM to their exhaustive, comprehensive lab tests. BLI Director of Office Equipment Product Analysis, Marlene Orr, was clearly impressed with Samsung’s monochrome printers and MFP (multi-Function Printer) series describing them with words rarely used in the same sentence to describe printers, quote: “Samsung Electronics understands what customers need most from their printing products: reliability, productivity and efficiency. 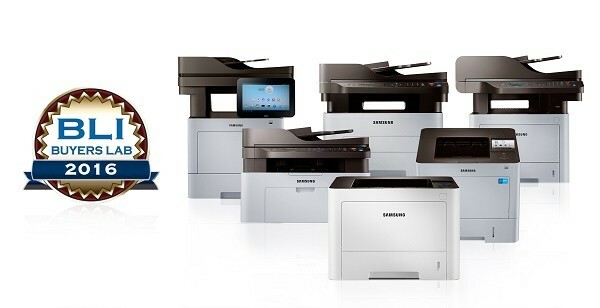 Samsung offers products that deliver strong performance and reasonable costs, maintaining its position as the leading printing solution provider in the industry”. So Samsung, in receiving this honour a fourth time, is the creme de al creme of Monochrome Printer and Multifunctional Printer (MFP). Now that’s saying a lot! This is Samsung’s fourth time winning this award but the recognition train doesn’t stop there. The Samsung ProXpress M3825DW series is bristling with a wide range of features ideal for SMEs. It can crank out 40 pages per minute from both wired and wireless sources, including printing from Google Android Smartphone using Google Cloud Print. It’s XOA (eXtensible Open Architecture) enables the fast implementation of third-party software, making scaling your printing needs a snap. The Samsung ProXpress M4530 Series comes packin’ a 1GHz dual-core CPU. This meaty processor, pretty huge for a printer, provides the power and capacity to accomplish print and copy jobs at a rate of 47 pages per minute no matter the size and complexity. The long-life drum and extra high yield toner is a Godsend for SME, allowing them to operate their Home Offices on a budget and reduce downtime typically due to toner running out. So love em’ or hate em’, 50 Cents Style, Samsung’s line of Monochrome Printer and Multifunctional Printer have got your back!